It is not often that I have time to try out a new writer. I don’t have enough time to read, apart from anything else. I’m still trying to catch up with Karen Maitland’s books, with Susanna Gregory’s, with the latest Paul Doherty’s – not forgetting Michael Connelly’s and Quintin Jardine’s. There are so many great books out there, and nothing like enough time. Last week, Transworld did that with Winter Siege. It’s cost me dearly. I haven’t been writing my own book as a result. Right. Bear with me. This is going to take a bit of explaining. First, the author. 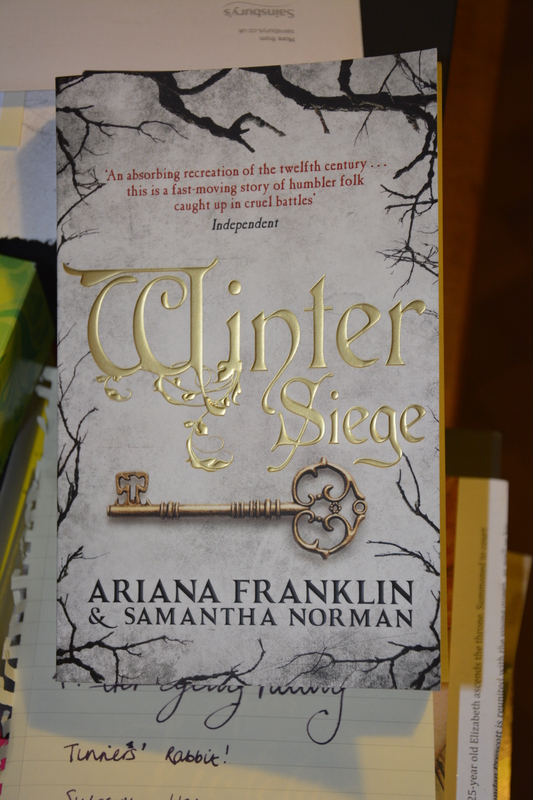 Well, the cover has the name Ariana Franklin, but beneath her name is her daughter’s, Samantha Norman. Ariana was a very popular medieval writer, but she died, sadly, in 2011, leaving a partly complete manuscript. Samantha took it up, and now, four years later, it’s published. It follows the lives of a few people during the wars between Stephen and the Empress Matilda in the twelfth century. A young girl in the fens is attacked, savagely beaten, raped and left for dead. Gwil, a mercenary, finds her and reluctantly takes her under his wing, but the attack has left her with no memory of her family, her home or even her own name. Meanwhile, the lady of Kenniford Castle, Maud, is trying to cope with her brutal husband. She never wanted to marry him, and now he is taking over her property, her villeins and her life. In the midst of the fighting all about the country, these three and their friends are about to be challenged by a man more mad than bad, who will seek to destroy them all for a small strip of parchment, a note that could destroy him. He will gladly kill for it. Okay, so what do I not like, what do I like, and what is my overall opinion? Well, there are bits and pieces that grate on me. Yes, because I am picky. I have been studying, reading and writing about medieval England, and I am now one of the world’s geeks about things to do with ordinary life and travel, weaponry and food. Yes, I nitpick. I can’t help it. Pretty much everything about it. This is a book that grabs you from the start with its evocation of medieval life, with the miserable existence of peasants on the fens, and with the depiction of living in a castle. It has well conceived characters who always retain their individuality, and more than that, their stories meld well. For a first novel, this is extremely impressive. For someone taking on somebody else’s ideas, it’s extraordinary. I liked it. I liked it lots. I liked it enough to delay writing my next book; to take this as my carry book while walking the dog; to stop me reading the other two books I have on the go at present. Not only that, I liked it so much that I’ve sent some questions to the author and I hope to have an update to this in a week or so. This is a great read by an author who, if she wants, could have a great future as an historical writer. So, if you get a chance, get a copy yourself. It’s on sale from today. Thank you for the very positive book review. I was a follower of Ariana Franklin’s “Mistress of the Art of Death” series, and I especially loved her portrayal of King Henry II. I don’t know how accurate it may have been, but I enjoyed it all the same. I definitely plan on reading it. I also read Paul Doherty’s books, too, and it looks like I should check out the others you mentioned. Glad that so many have good memories of Ariana. Thanks for the comment!